Sections SEARCH Skip to content Skip to site index Family Subscribe Log In Log In Today’s Paper Family | The Boston Marathon is Monday. Here’s What You Need to Know. Advertisement Supported by A bounty of pre-race coverage of the 123rd running of this prestigious event. 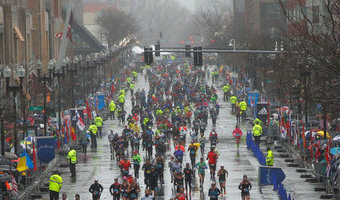 ByJen A. Miller April 13, 2019 Welcome to the Running newsletter! Every Saturday morning, we email runners with news, advice and some motivation to help you get up and running. Sign up here to get it in your inbox. Happy Boston Marathon weekend! The 123rd running of this prestigious event, one of the six World Marathon Majors, is happening on Monday. We’ve got a bounty of coverage for your pre-race reading: Matthew Futterman wrote about Sarah Sellers, who finished second in the women’s race last year. Futterman, whose book “Running to the Edge: A Band of Misfits and the Guru who Unlocked the Secrets of … [Read more...] about The Boston Marathon is Monday. Here’s What You Need to Know.